PRETORIA, South Africa (AP) — Oscar Pistorius was taken away in a police van with barred windows Tuesday to start serving a five-year prison sentence for killing girlfriend Reeva Steenkamp. Delivering her sentence, Judge Thokozile Masipa cited the “gross negligence” the double-amputee Olympic runner showed when he shot Steenkamp multiple times through a toilet cubicle door in his home. 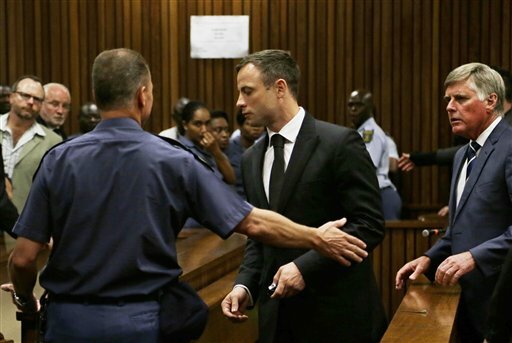 Pistorius, who had cried and wretched during his trial, was unemotional as he stood to hear his sentence. His prison term begins immediately and he was led down a flight of stairs and toward holding cells before leaving the South African courthouse in the armored vehicle. Masipa said her sentence was a balancing act between retribution and clemency. Masipa last month convicted Pistorius of culpable homicide, but acquitted him of murder after he testified he mistook Steenkamp for a nighttime intruder. She asked Pistorius to stand as she delivered the sentence Tuesday, and he faced her with his hands clasped in front of him. Pistorius was then led away by police, stopping briefly to grip the hands of his uncle and other family members as he headed to prison. Pistorius’ defense and the prosecution have 14 days to lodge any appeal against the judge’s decision. Prosecutors said they are considering whether to appeal the sentence, where Pistorius, 27, could serve less than a year in jail for killing his 29-year-old girlfriend. Nathi Mncube, the prosecution spokesman, said his office was disappointed in the culpable homicide conviction and had not yet decided whether to appeal the sentence. “We have not made up our minds whether we’re going to appeal it or not,” he said. He added that there was an “appetite” to appeal but that prosecutors would review their options. “We are satisfied with the fact that he will be serving some time in prison,” Mncube said. Masipa had a wide range of options available to her because South Africa does not have a minimum sentence for culpable homicide, which is comparable to manslaughter. Pistorius faced up to 15 years in jail, but could also have received a completely suspended sentence or house arrest. Marius du Toit, a legal analyst and criminal defense lawyer, said Pistorius would have to serve one-sixth of his sentence in prison — 10 months — before he could be eligible to be moved to house arrest. As Pistorius left in the police van, a raucous crowd gathered around the vehicle, whistling, shouting and banging on the caged windows.